Inspired by traditional greetings, this Traditional Happy Holidays Photo Christmas Card is perfect for all the winter holidays. 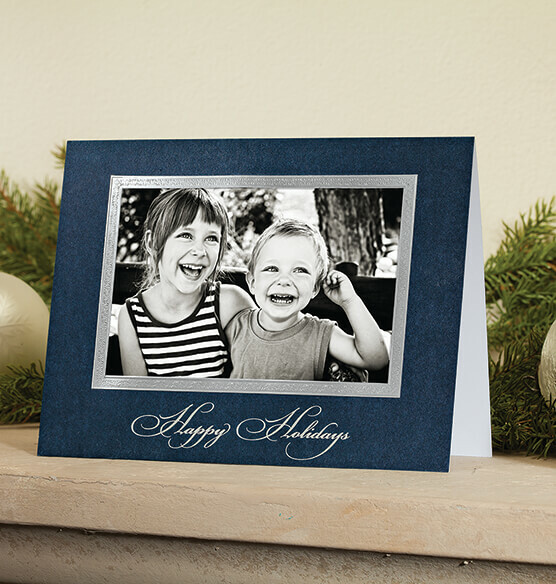 The festive blue frame of this photo insert card surrounds a detailed silver border to showcase your photo. "Happy Holidays" appears at the bottom in scripted silver foil font for a lovely flourish finish. Inserting a black and white or color photo is a cinch with the easy slide-in pocket design. Once your photo is in place, your card is ready to place inside a matching envelope. There are several options for personalizing your card set, including card only and card and envelope. To customize it, provide us with up to 3 lines of unique text, which appears inside the card near a pre-printed holiday sentiment. Includes free envelope seals for a classy touch. Pre-printed interior verse: "Wishing you the simple joys of the holiday season"